← Read the Label: Organic? The surgeon who rebuilt my arm asked me to speak to his son’s Boy Scout troop, La Jolla’s Troop 4, about outdoor adventuring this Monday. I showed slides of Denali, the Sierra Nevada, and talked about the Appalachian Trail. Earlier just that morning (3:30am!) we had returned from Utah. 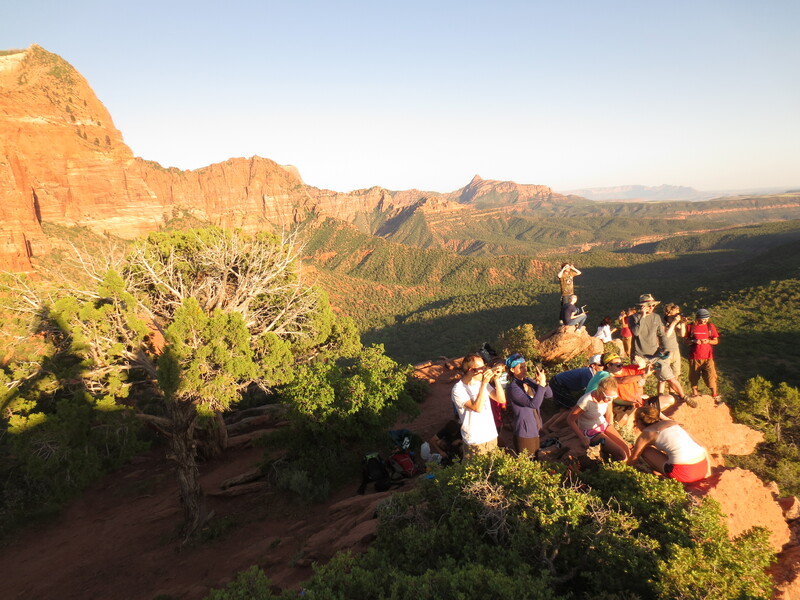 During the talk I realized that organizing this past weekend’s Zion National Park trip for 29 people was essentially a slight variation on planning a Boy Scout trip. With a little beer and women thrown in for good measure. Since I was the trip organizer, I knew everybody– being surrounded by friends was the most important part of the trip for me. Friends came in from LA, Colorado and Washington, as well as many from San Diego, and it was a huge outdoor fiesta! While San Diego was in the path to see the partial eclipse, Dallas and I decided it’d be worth traveling north to see totality of the annular eclipse, which cut through southern Utah. Totality in an annular eclipse means a ring of fire–as I understand the last time we will see this from US soil for at least ten years (though there will be an even more dramatic total eclipse soon, in 2017). In usual haphazard form we went with no gear save some cardboard boxes to make pinhole cameras. When we got to the overlook we borrowed some goggles from some people who had extras which made the experience safer than using a triple set of sunglasses as I had planned. We used point-and shoot cameras. Because that’s how we roll. Taken during totality: the “ring of fire” is the sun protruding around the moon in all directions. I could glimpse the eclipse “naturally” out of the corner of my eye, but really most of the watching was done through the goggles. 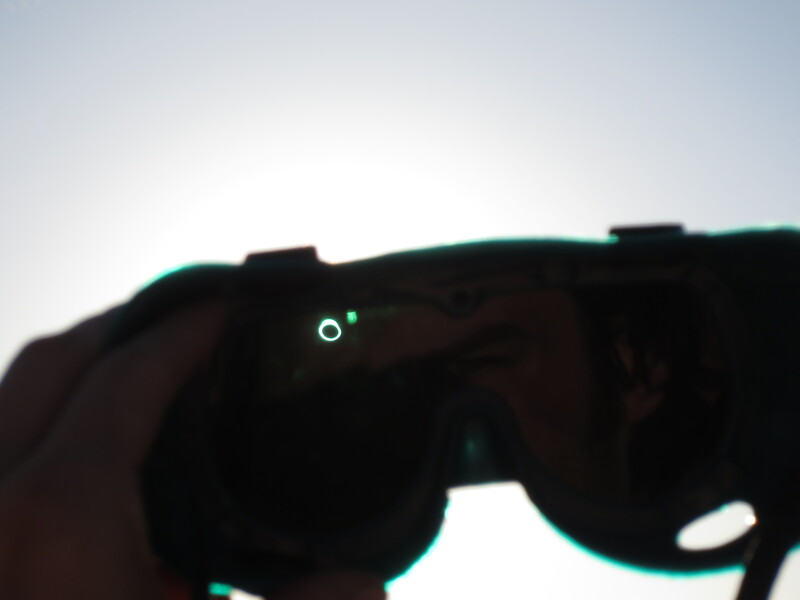 Which meant, to me, a sort of artificial nature experience–I’d have preferred to see it without a convoluted scheme–which cannot be safely done during an annular eclipse. Still an amazing sight though. We watched from Kolob point in Zion National Park, a very interesting and beautiful promontory on its own. The red cliffs got dimmer and then brighter again before and after totality, like a sunset. The rest of the trip was also great. Gil, Brad and I climbed the 8-pitch route Shune’s Buttress, an old aid climb first freed by Conrad Anker in the mid-90’s and now one of the Zion free classics. Brad got it clean; I slipped on the .11d crux and also hung on the p7 .11 enduro splitter fingers/ thin hands pitch. Seven pitches of splitter crack, from fingers to ow to chimney, and an 8th pitch with an amazing bolted v4ish boulder traverse. Four stars. 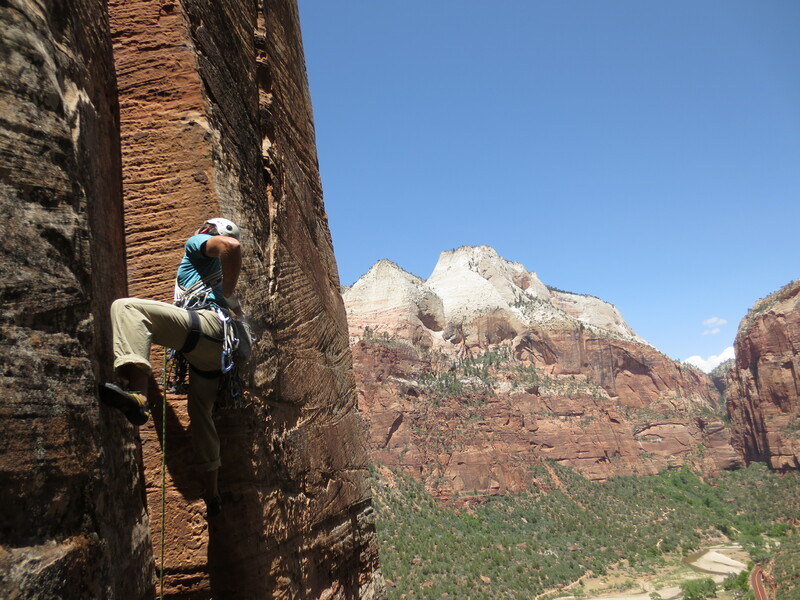 While the cracks are not as “pure” as Indian Creek, the Zion textured sandstone meant some decent feet that really help and make for more creative climbing. We got the route done as a group of 3 in an afternoon, and it felt almost casual. Maybe it was just the amazing vibe of the place and the chill attitude of strong partners. 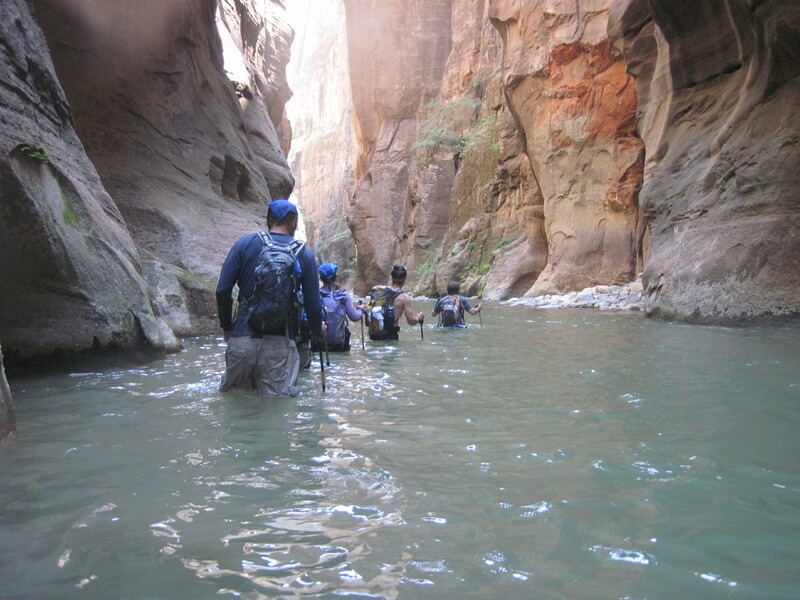 The main physical activity of the weekend was to hike the Narrows, a 16 mile stretch of the Virgin river that meanders through slot canyons most of its distance. 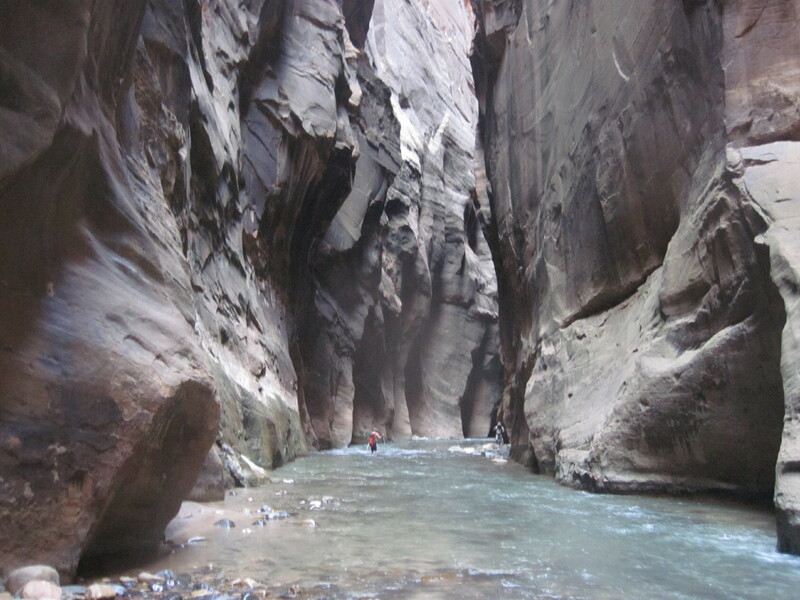 The hike is often considered in the top 5 hikes in the USA, and has been on my radar for years. Many people hike a bit from the end and back, which is indeed the most beautiful part and probably does indeed give you the feel of the thing. Still, the most very beautiful parts are near the beginning, and doing the thing end to end also has a sense of completion about it. I led a group of 8 people on the hike (Dallas led a group of 10!) but we only saw 2 other parties of 2 until we got to the day-hiker area. 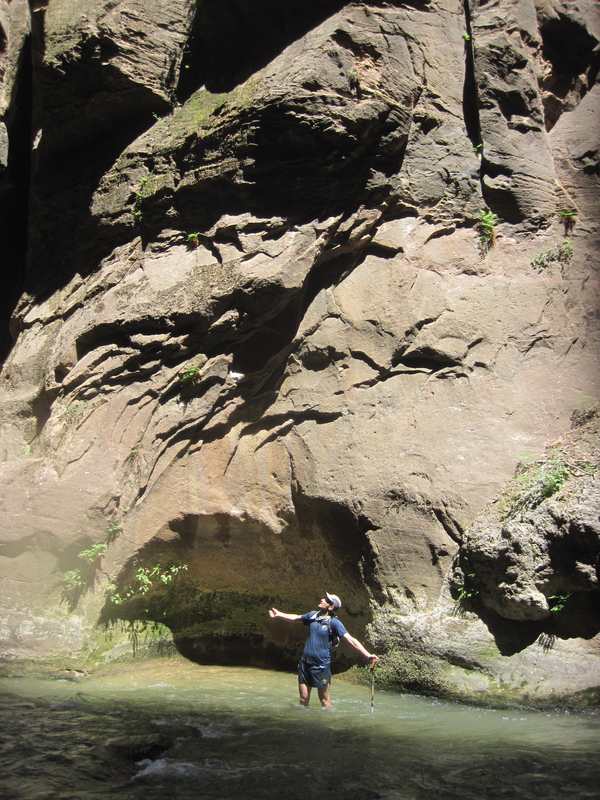 So the trip felt remote, despite the hordes waiting at the bottom in the main part of Zion National Park. The Virgin, despite being early season, had a low water level this year, typical of a month or two later. Most was calf-deep wading, with a good amount of knee-deep. Occasionally thigh or waist deep, but the only swimming was for fun. It was cold though, especially the toes in the early morning! 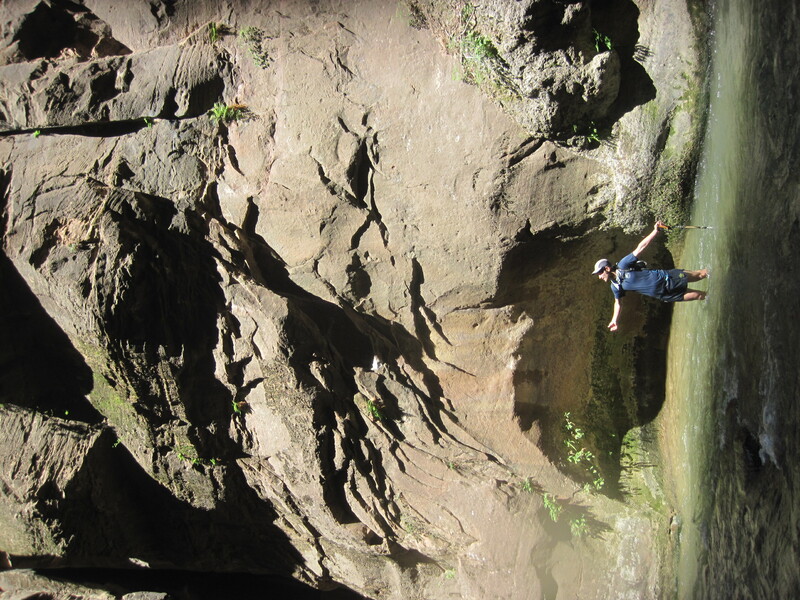 This was only my second trip to Zion as an adult, even though it’s in decent range of SoCal. Must go back soon for great climbing, views, and more amazing time with friends! This entry was posted in Climbing, Great Nature. Bookmark the permalink. 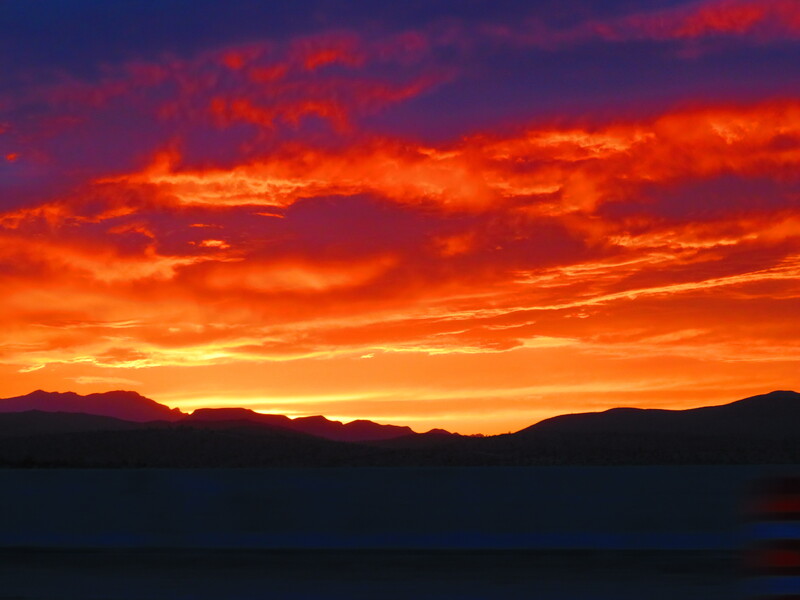 I remember that sunset too. Beauty of absurd magnificence. Wow, it looks amazing there, it makes me want to jump on a plane! The sandstone formations look out of this world! Awesome hike! and looks like a cool place to see the eclipse. Eclipse viewing in Los ALamos was geek heaven: there was any and every kind of gadget and device for viewing.